Rocky Fork State Park is 2,075 acres of scenic wilderness in Unicoi County, in the southern Appalachian Mountains of Upper East Tennessee. The park is approximately 30 miles from Johnson City and 10 miles from Erwin, the county seat. Rocky Fork is Tennessee's newest state park and it is surrounded by the Cherokee National Forest. Rocky Fork State Park is the only Tennessee State Park that connects directly to the Appalachian National Scenic Trail. This predominately Appalachian Cove Forest park was saved from residential development because of it's biologically diverse habitat, the Historic Battle of Flint Creek Site, and it's exceptionally clean streams and Rocky Fork watershed, which includes the park's namesake, Rocky Fork Creek. Rocky Fork State Park has long-term plans for improving the current nearly 14 miles of trail into a sustainable and high quality trail system for hikers, mountain bikers, and horseback riders. The park is a "Gateway to the Appalachian National Scenic Trail (A.T.)". The park's planned infrastructure and amenities includes a visitor/interpretive center & gift shop, restrooms, picnic shelter, and maintenance building. The park offers a variety of interpretive hikes & programs, special events, and trail volunteer opportunities every month for park visitors and the surrounding community. 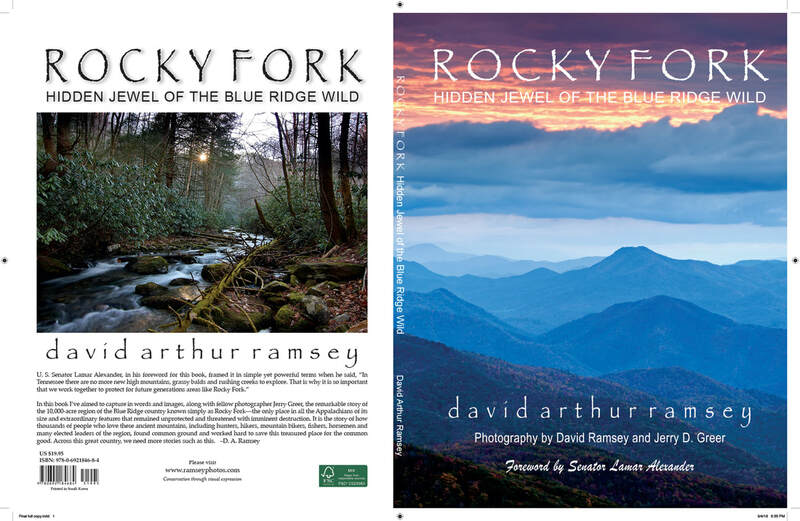 To purchase David Ramsey’s book and support the important work of the Friends of Rocky Fork State Park! Books can be purchased at: https://www.ramseyphotos.com/image-use-/-licensing , Mahoney's Outfitters (830 Sunset Drive, Johnson City, TN 37604 , or at the Town of Unicoi Tourist Information Center, 106 Unicoi Village Place, Unicoi, TN 37692 .